Set of 3 templates. A fun and curvy flower inspired shape that has a beautiful embossed ring in the middle of its design. Another beautiful addition to the Medallion series! The border die has two different uses. 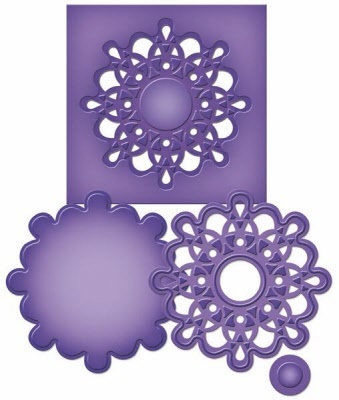 As a singular shape, it creates a solid die cut but when nested with the inset die, it creates a beautiful embellishment. Used alone, the inset piece creates a wonderful inset pattern.